shhhhhh...don't tell anyone...but i'm turning 40 in a little under a month. chuck's taking me to portland as a birthday gift - how cool is THAT? (getting old has its perks!) 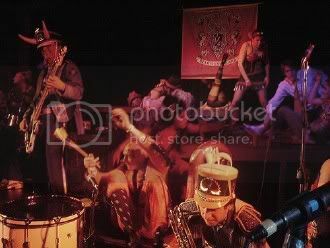 to celebrate, we'll be going to see march fourth marching band at the doug fir. care to join us for an evening of heart pounding beats and general mischievous behavior? wanna see their latest videos? that's what i did for my 40th! thanks to you we stayed at the doug fir and everything. i loved it. congrats on the up and comming B-Day... Portland is wonderful! if i could marry portland, i would. and i'd even have its love child..
and yes...we will definitely celebrate on our home turf!!!! i'm all for that, no birthday required..stay cool little missy...this heat is unbeWEEVable!!! That looks like a great time. Interesting band and show. You guys have fun and congrats on the big fooorOhhh! Maybe I'll have an overnight in Portland. ooooOOH!!!! that'd be aweSOME if you were there!!!!! and, btw....would you kiiiiiindly STOP sending that nasty hot air our way?!?!?!? !